For other uses, see Anti (disambiguation). A form tied to the powers of darkness. Sora gains agility, but has limited access to commands. 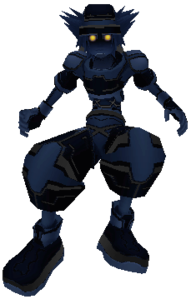 AntiForm is a Drive Form which appears in Kingdom Hearts II. It uses both party members, and consumes all of Sora's Drive Bars. It represents the darkness that still dwells within Sora's heart, and it is obtained along with Sora's new clothes at Mysterious Tower. Its emblem is a black, demonic silhouette. 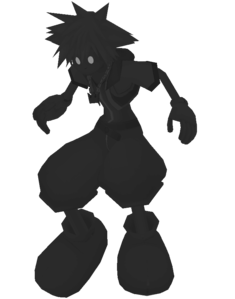 AntiForm is strongly reminiscent of the AntiSora Heartless from Kingdom Hearts, and Tetsuya Nomura has confirmed in an interview with Famitsu that Sora's ability to enter this form is due to his transformation into a Shadow. 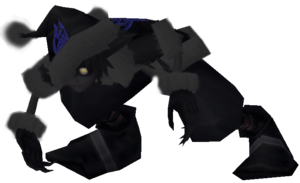 [please confirm] Specifically, Sora's AntiForm has more feral behavior, in that it runs about on all fours, and instead of using the Keyblade in this form, Sora attacks with claws on his hands. In addition, when hanging onto a ledge, Sora's AntiForm clings with one foot, rather than one hand. 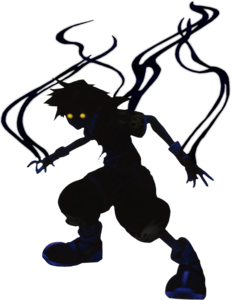 Aesthetically, Sora's skin and hair become ink black, his eyes glow yellow like a Heartless's, and his clothes become black with blue accents. Furthermore, he constantly emits darkness from his arms and back in the form of misty black and violet wisps. Unlike other Drive Forms, AntiForm cannot be purposefully activated. Instead, it will be randomly activated when Sora attempts to enter Valor, Wisdom, Limit, or Master Form, based on a hidden "Anti Point" counter. This counter is increased by 1 every time Valor, Wisdom, Limit, or Master Form is activated, but is reduced by 10 when Final Form is used. Gameplay-wise, AntiForm exists as a consequence of abusing the Drive system, and it is meant to be "strong but troublesome". However, the counter system is ignored while the Two Become One Keyblade is equipped, as its Light & Dark ability will make it so only AntiForm or Final Form activates when a Drive Form is used. AntiForm starts at having a 75% chance of being the activated form when a Drive Form is used in this state, but this percentage goes down to 50% and then 0% until Final Form is obtained. It is also impossible for Sora to enter AntiForm while an unconscious ally is on the field, or if he is trying to change to Final Form. AntiForm can only be manually deactivated outside of battle, though its Drive Gauge caps out at 6, and consuming Drive Orbs will actually cause the gauge to deplete faster. In addition, though Drive Forms normally persist through cutscenes and Cup seeds, AntiForm will instead revert to Standard Form. Unlike the other Growth Abilities, AntiForm's "Anti Glide" ability cannot be leveled and is thus inaccessible in Standard Form. Like Valor Form, AntiForm cannot use magic; in fact, it cannot use any commands beyond "Attack" and "Revert." Furthermore, Sora cannot pick up HP Balls while in AntiForm, meaning he is completely unable to heal in any way. 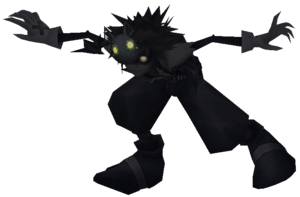 Although Sora moves at twice his normal speed while in AntiForm, he takes 50% more damage from attacks, and he does not gain experience from defeated enemies. Scratch Weapon Automatic ground combo move. Sora executes a double scratch, a rolling attack while holding his feet, finishing with a hammer-like attack with both hands. Kick-Up Weapon Automatic ground combo move. When the enemy is at long range, Sora scratches and repels the enemy with an upward kick. Dance Kick Weapon Automatic Ground combo move. When numerous enemies are nearby, Sora spin-kicks repeatedly. Side Spin — Ground combo move. Pressing during a combo on the ground, Sora blazes in a circle around the enemy, slashing with claws and dark magic. Wild Dance — Ground combo finishing move. Sora moves around the enemy and scratches repeatedly, finshing with a diving attack. Ground Flash Weapon Ground combo finishing move. When various enemies are nearby, Sora quickly scratches and repels them. Air Dance Kick Weapon Automatic air combo move. Sora kicks an enemy, then does a dash attack through him. Air Giant Wheel Weapon Automatic air combo move. Sora rapidly spins around an invisible axis, attacking with his feet. Air Wild Dance — Air combo finishing move. Sora scratches an enemy and finishes with a diving attack. Midair Doom Dark Air combo finishing move. Sora launches a blast of dark magic below him, hitting all enemies around. Anti Glide By pressing on the ground, Sora jumps backwards, spins around and flies forwards. If there are enemies he will home in on one and move into a position behind them. When using AntiForm, the lack of any method of healing means that the player's main goal will be to evade the enemies. Although AntiForm's high speed and Anti Glide ability make it easy to stay safe through simply evading the enemy's attacks, its quick combos will often let it keep an enemy stunned while also dealing damage, and can also deflect many attacks automatically. Furthermore, several of AntiForm's attacks have a neutral or dark attribute, allowing them to break through enemies which are immune to the weapon-attribute, like the Large Body. Unlike other Forms, AntiForm automatically reverts to Standard Form when Sora moves to another room, emptying the Drive Gauge. However, if the room is a World Exit or one where party members are walking around, it will refill as normal. Because of this, the Brink of Despair can be used to easily recharge the Drive Gauge immediately after defeating Roxas, allowing the player to repeatedly activate Drive Forms with Light & Dark equipped in order to unlock Final Form. ↑ Yen Sid's mirror: "An image of you overcome by the power of darkness flows into your mind." ↑ 2.0 2.1 Famitsu Interview; Interviewer: "Is AntiForm originated from when Sora got turned into a Heartless?" / Tetsuya Nomura: "Story-wise, yes. Drives are very strong so AntiForm exists as a side-effect of using too much power. System-wise, I wanted to create something strong but troublesome." Translation by KHInsider. This page was last edited on 7 April 2019, at 08:25.